A little confession: I have a deep, serious love for my iron skillet. I am perplexed when people say they've never used one, because I use mine almost daily. 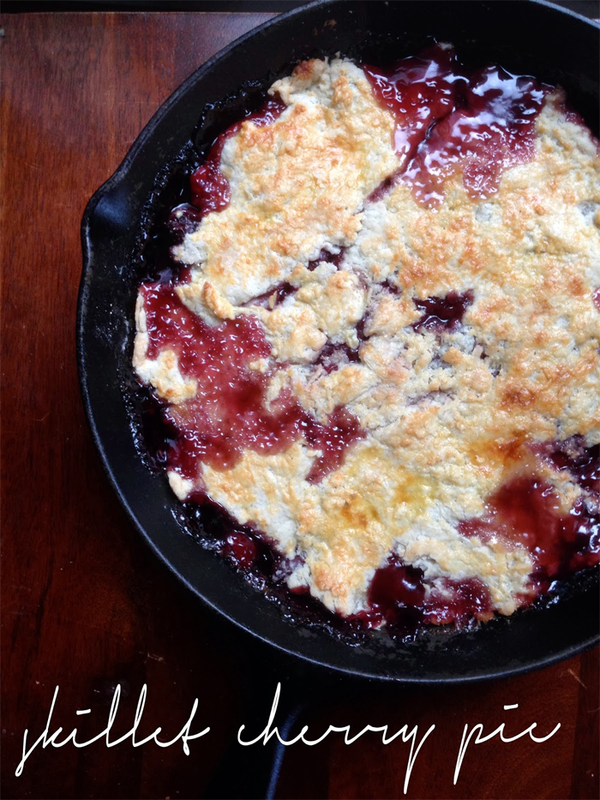 Main dishes, desserts, whatever - it might be my favorite piece of cookware. Plus there is something so nostalgic about it, knowing they've been used for ages - I feel a kindredness with women of past generations. I'm weird like that. If you don't have one, I urge you to pick one up the next time you're out. You won't be sorry. and I knew there was a cherry pie in my near future. or switch up the fruit completely to suit your taste. Drain cherries of any liquid and pour into the skillet. Toss with sugar, cornstarch and salt. Top with pie crust - I made an all butter pie crust, and it took less than 10 minutes, and it doesn't have to be pretty. You can buy it ready made, but trust me - this is cheaper and tastes a hundred times better. Whisk together egg yolk and milk and brush over the top of the crust. Sprinkle with sugar. Bake at 350F for 20-25 minutes, until crust is golden brown. Let pie cool a bit, serve warm with whipped cream or vanilla ice cream.